Light n’ Easy! Curious as to whether or not this lesser-known steam mop is worth looking into? This week we have the Light and Easy steam mop and we’re ready to put it to the test. Are you on the fence about some of the bigger name brands and would like to know how this guy stacks up? Continue reading below to discover if the Light and Easy is the right steam mop for you. Easy-to-use pumping technology makes steam cleaning simple with this mop. The Light and Easy struggles with thicker, set in stains on your hard floors. This steam mop has a small water tank, meaning you cannot clean a large space in a single fill. The Light and Easy steam mop is designed just as the name suggests, lightweight and simple to control. This steam mop sits upright much like a stick vacuum does and contains the traditional steam mop shape. DESIGN | The Light and Easy has an ergonomic handle for easy pushing and pulling. Directly below the handle, on the rear side of the mop, is a cord wrap, which allows users to store the cord neatly when the mop is not being used. Along the front side of the unit is a water tank, which is also considered the main body of the steam mop. Continuing down is the cleaning head, which holds the cleaning pads in place while using the mop. CLEANING PADS | The cleaning pads are held on by small velcro pads that are built into the bottom of the Light and Easy steam mop cleaning head. Between the velcro pads are small slits that allow steam to be pressed out of the bottom of the cleaning head and through the cleaning pad. AESTHETIC | This steam mop offers an extremely simple aesthetic. White and gray are the colors used and there are no extra buttons or knobs on the mop, Just a removable cap that closes up the water tank. The Light and Easy steam mop cleans through one primary method; steam comes through the cleaning pad. STEAM THROUGH PAD | The water in the tank is heated up after about 20 seconds. After this time has passed, users can pump the handle down and up to produce steam, which is then pumped through the bottom of the cleaning head and through the cleaning pad. As the mop is continually pushed around, the steam continues to be produced and pushed through the cleaning pad. How tall is the Light and Easy mop? 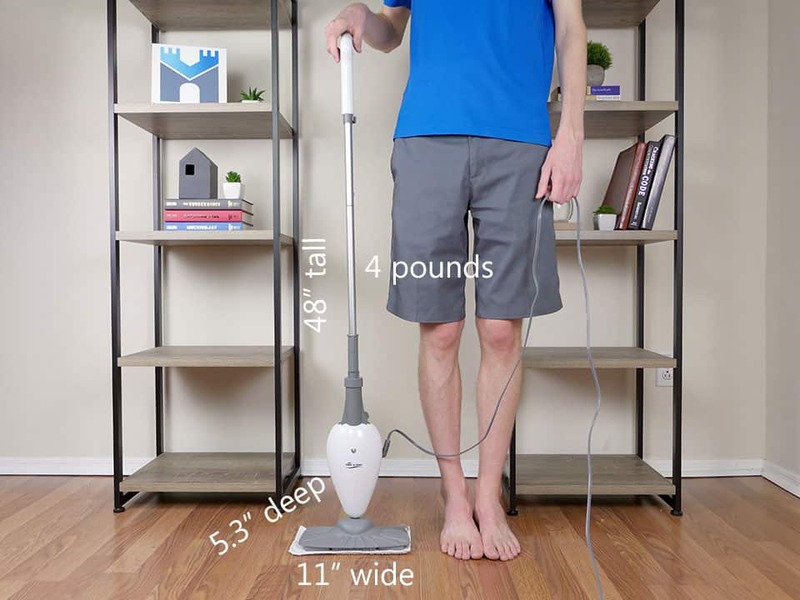 The Light and Easy steam mop is about average height compared to most steam mops we have tested, coming in at 48″ tall. The width of this mop is 11″ and the depth is 5.3″. Additionally, the unit weighs 4 pounds. What accessories come with the Light and Easy? As one of the most simplistic steam mops we have tested to date, there are not many extra parts and accessories included. The two extras included with the purchase of this steam mop is a cleaning pad (1) and a water tank filling flask. Cleaning Pad: One cleaning pad is included with the Light & Easy. This pad is washable and can be reused numerous times before needing to be replaced. You’ll eventually need to replace the cleaning pads, but they are fairly inexpensive. Water Flask: The water flask is used to fill up the water tank on the unit itself. Fill the flask and pour that water directly into the tank located on the Light & Easy. Or if you prefer, you can fill the unit up directly under the facet. While this steam mop may not initially include a wide variety of accessories, you do have the option of purchasing more. Extra cleaning pads and a carpet glider tool are some of the extras you have the option of purchasing. The cleaning pads will be similar, if not identical, to the pad sent with the mop. The carpet glider tool is a plastic attachment that can be snapped onto the bottom of the Light and Easy, allowing you to steam clean carpets for sanitization. RELATED | See the Shark Genius Pocket and Shark Pocket (S3501) for other impressive steam mops we’ve tested. The following tests are designed to show how the Light and Easy performs as both a mop and a sweeper. We tested the Light and Easy as a mop on tile flooring, spreading three different debris types across the floor and attempted to mop the debris up over three separate passes. Next, we tested the Light and Easy steam mop as a sweeper, making several sweeping passes across a dusty hardwood floor. After doing so, we took a look at the floors and made our assessment of the Light and Easy’s cleaning performance. Each of these debris types offer a different level of stickiness and consistency, allowing us to test the Light and Easy steam mop against a light, heavy, and liquid substance. All three debris types are spread across our testing lane in three separate sections. Measure out 3 oz of water (dyed green) and spread the water across the back of the testing lane. For more, see our full list of mop reviews here. The Light and Easy steam mop performed well but did leave something to be desired on our cleaning tests. Our water test (dyed water for visibility) was by far the toughest test for the Light and Easy to complete. After making a single pass through the water, the cleaning pad did its best to absorb as much as it could. That said, the pad was virtually soaked after this first pass. Therefore, we were only able to clean up about 50% of the water. Just to test the cleaning pad completely, we tried to make another pass over the water. This only lead to more water being spread out across out testing lane. All things considered, I do believe a larger cleaning pad would be beneficial for this steam mop. The Hoover Twin Tanks steam mop uses a larger cleaning pad, which allowed us to soak up more of the water. Mud was much more of a success when compared to the water test. After one pass across the mud, the Light and Easy steam mop was able to lift up 95%+ of the mud. From there, each remaining pass left no visible mud remnants. The steam produced by pushing the mop back and forth allowed the cleaning pad to easily slide across the mud and lift it up with each pass. In the end, the Light and Easy steam mop was able to remove 100% of the mud we spread across our testing lane. On the other hand, the honey test was not as easy to complete. With honey being such a thick, sticky substance, the Light and Easy was not able to slide across the debris with as much ease as the mud. Even when steam was pumping out at max capacity, the honey proved to be difficult for this steam mop to clean up. The cleaning pad was close to coming off of the cleaning head, simply due to how the honey was grabbing the pad. Once we completed the honey test, we found that the Light and Easy steam mop was able to remove about 75% of then honey. As noted above, the Light and Easy was about average with regard to cleaning, but I would have liked to see a strong performance from, this steam mop. The sweeping tests were a much larger success for the Light and Easy steam mop. Since the sweeping test does not include sticky substances, but rather dust and light dirt sitting on a hardwood and tile floor, the mop was able to glide across the floor swiftly and smoothly. This allowed the mop to sweep quite well, removing a vast good amount of dust and dirt that was sitting on the floor. In my opinion, the floors looked visibly cleaner after using the Light and Easy steam mop. Other great sweeping steam mops include the Bissell Crosswave and Braava 380t, both of which performed great during our cleaning tests. Using the Light and Easy steam mop is simple, but may not be the right fit for every user. There are no tools required to set up this steam mop and it takes about 30 seconds to complete. FILL TANK | Filling the water tank is also quite simple. There is a small cap that screws on and off to open or close the water tank. One the cap is off, users can use the provided water flask to pour water into the tank. One side note, I did find that the hole to pour water into was a bit small. It was hard not to spill the water when pouring it into the tank. CLEANING PAD | Taking the cleaning pad on and off is not difficult. The pad is held on by velcro straps located on the bottom of the cleaning head. To remove the pad, just pull from one of the ends and it will come off of the cleaning head. With this mop, there is only one steam mop. After filling the water tank up, the unit can be plugged in. From there, you must wait 20-30 seconds to allow the water to heat up inside the water tank. Once that time has passed, users can pump the handle up and down, which will produce steam for cleaning. All things considered, the Light and Easy steam mop is not hard to use, but there is some manual labor required when trying to create steam for cleaning. Maneuverability on the Light and Easy is perhaps one of the biggest downfalls about this steam mop. TURNING | The turning radius of the Light and Easy is not too good. As we tried turning the handle to turn the mop as a whole, the cleaning head began to lift up almost immediately. Therefore, cleaning around obstacles in your home may be a bit of a nuisance, as this steam mop does not turn well. The Light and Easy doesn’t have a rotating joint in the head, meaning it effectively has a turning radius of zero. FLAT LAY | The Light and Easy cannot lie completely flat on the ground, but it gets reasonably close. This is a bonus when trying to reach deeply into those lower spaces. MOVEMENT EASE | At 4 pounds in total weight, moving this steam mop around is not an issue. Most users should find that this mop is able to move around quite easily. Maintaining the Light and Easy is extremely simple. Wash / replace the cleaning pad and fill the water tank, as necessary. Change the cleaning pad – The cleaning pads can be washed and reused. Once you notice the pads are starting to deteriorate, it may be time to order some replacements. Fill water tank – The water tank must always be filled to ensure steam can be produced. Without water, the Light and Easy is not able to clean properly. Maintaining the Light and Easy steam mop on an annual basis should cost around $5 / year. This includes replacing the cleaning pad twice a year. There is no specific recommendation on how often you should replace the cleaning pad with the Light and Easy steam mop. Therefore, based on previous tests and data, we believe replacing the cleaning pad twice a year is fitting. Is the Light & Easy a Good Value? The value of the Light and Easy steam mop is okay. The price is low, but it is kind of a “you get what you pay for” type of mop. In terms of performance, we did not see the best results. Throughout our cleaning tests, we found that the Light and Easy was not able to lift and remove the debris from our testing lane with ease. It took a lot of effort and steam to completely remove the debris off of the lane. The Shark Pocket steam mop is about the same price as the Light and Easy, but also offered better performance across the board. I would have a hard time recommending Light and Easy as long as the Shark Pocket is available at this price. With regard to warranty and returns, Light and Easy offers a 1-year limited warranty and a 30-day return period, via Amazon. Who Should Buy the Light and Easy Steam Mop? The Light and Easy is not a steam mop that we at Modern Castle would recommend. There are other options within the same price range, such as the Shark Pocket and Hoover Twin Tanks, that offer a better value overall. Want an average performer – The performance of the Light and Easy steam mop is not bad, but there is certainly a level of cleanliness that you do not get from this mop. if you’re looking to use it just as a sweeper, then it could be a good fit. If you need more of a primary mop, I’m not sure that the Light and Easy is the most appropriate option. Don’t mind a corded unit – This steam mop has a 19.6′ cord, so you will want to be sure you’re okay with a corded unit over a cordless one. Want an inexpensive steam mop – On the bright side, the Light and Easy is not an expensive steam mop. If you’re restricted heavily by a budget, this could be a good option for you. For more information on the Light and Easy visit Amazon.com. The Light and Easy steam mop is a low cost mop that is designed to be a simple mop for those who may not want or need all of the bells and whistles included with some of the higher end mops. The cleaning performance of this mop could be better, but for the price you pay, you cannot expect much more. Those who want more of a floor sweeper / sanitizer may find this steam mop to be a good fit. Yet, it is probably not going to replace your primary mop.